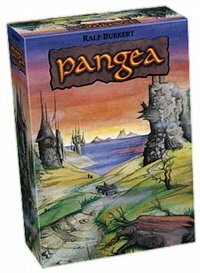 Launching alongside Pecking Order in the Immortal Eyes Games line is Conquest of Pangea, a new game from Phil E. Orbanes (creator of Cartel and many others). Hundreds of millions of years ago... The lands of the Earth are joined in a massive super-continent: Pangea. It is a time shrouded in mystery. Life ascends. The struggle for survival and dominance begins. Intelligent species arise as unstoppable geological forces begin to tear the lands apart. Guide your species in this ever-changing world. Use your guile to weather the storms and cataclysms assaulting Pangea. Apply strategy to survive and thrive asâ€”one by oneâ€”the continents of Pangea separate from Africa. Now, travel two hundred and fifty million years back in time and join in the... Conquest of Pangea! This is a very abstract game pasted onto a somewhat bizarre rendition of geological history. Each player controls a species running rampant on Pangea as the supercontinent begins to break up, and dominating a particular region (in the ecological sense) grants bonus card abilities to that species. I can't exactly explain how these nonspecific species have the Power of Sky Magic or Fire, as a scientist, so the theme is a tough nut to swallow. The underlying mechanics, however, are interesting and enjoyable to play with three or more players (I don't recommend two! ).